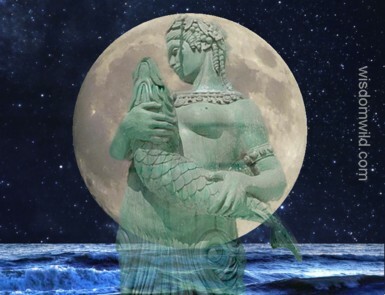 Moon full in Pisces brings compassion and creativity (Pisces Moon, Grand Earth Trine, & 5 quintile aspects). She invites us to lean inward to soften and receive healing after the intensities of the eclipse season. Moon and Sun together bring cleansing and spiritual nourishment grounded in the practical. What is disruptive to our well being is illuminated (Virgo Sun), and dissolved or washed away(Pisces Moon). We are encouraged to create calmness and stability by entwining our inner and outer worlds. Strong support is provided by an abundance of feminine energy (8 planets in Earth & Water Signs) and sacred connection is enhanced and deepened (Sun & Moon together + Grand Earth Trine & ongoing Jup-Nep trine). Things now come with more natural ease; we have more focus and an increased ability to open and receive (Grand Earth Trine). Now is the time to reflect upon and integrate all that has ‘arrived’ through the eclipse season and this lunar cycle. Time to let go the chaff and unnecessary trappings, and step into the fullness of you and the bright Moon Light.